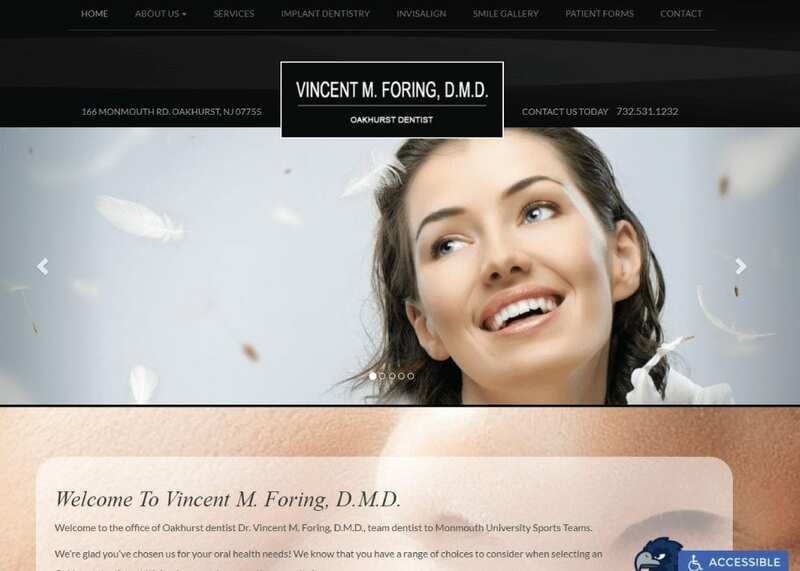 Dr. Vincent M. Foring’s website (Ocean Township Dental) opens with a balanced black and white design augmented by a slideshow of people and a large image of a set of beautiful teeth. This dental office wants to welcome people in a while giving a clear indication of what it can do for visitors. Multiple locations mean that convenience is paramount their provided experience, as well as an assurance of comfort and pleasing results. They also make it clear they offer a broad variety of dental service, making this the perfect design for a one-stop dentist’s shop. Heavily focusing on the visual design elements this site brings the viewer in and invites them to join the family. The overall feel of the place is one of activity and results happening in a welcoming and professional environment. Dr. Foring’s website was designed in a way that brings clear options to the visitor, information in a snap, and a list of associations to lend the site an air authority. Its overall design is flowing and impactful, and targeted at turning web visitors into new patients. White is a color that is commonly associated with cleanliness and professionalism, while black brings notes of authority and reliability. All of these features are desirable in a dental practice, and when combined with subtle undertones of blue (for trust and compassion) and excellent imagery, this website creates the perfect attraction for the visitor looking for a new practitioner. Breaking it down from top to bottom we enter the scene with a list of understated links at the top of the page. This isn’t the first thing that catches visitor’s eyes though. Instead, visitors are drawn to the name of the facility and the community it serves, lending an air of authority to the practitioner’s name and looking to draw visitors into the photos so visitors can start dreaming of visitor’s potential results. Below that visitors find the pedigree of Doctor Foring imposed over a bright shining smile, simultaneously sending a sub-conscious message of friendly treatment and displaying what visitors smile could look like after a visit. The marketing here clearly focuses on establishing the website and its doctor as an authority in their field and setting you at ease before you commit to an appointment. The grey on black links on the top of the page is designed to provide accessibility, but the site wants to draw your eye down the page, bringing you the dentist’s certifications, the organizations he’s affiliated with, and a line of testimonials to show a history of satisfaction among his visitors. Professionalism blended with a family atmosphere is heavily evident in the look of this website. The images presented in the slideshow indicate that this is a young dentist looking to work with young families and individuals. Dr. Foring’s website was designed to serve a young and active community, but with minor modifications could just as easily be made approachable for a more mature set of clients and visitors.